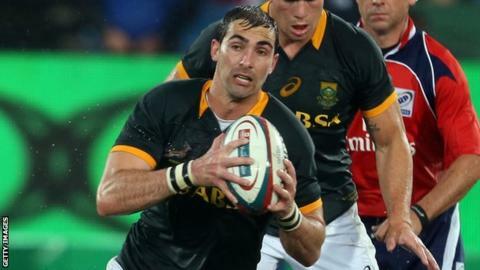 Ulster scrum-half Ruan Pienaar has been ruled out of South Africa's European tour after failing to recover from a knee ligament injury. Pienaar, 30, suffered the injury in the Springboks' 14-10 defeat to New Zealand in September and has not played since. "He needs a few weeks of rehabilitation before he'll be ready to return," said the Springboks' doctor Craig Roberts. South Africa begin their tour against Ireland at the Aviva Stadium in Dublin on Saturday. Jano Vermaak, who played in three Tests in 2013, will join the Springboks as a replacement for Pienaar.